Sinn Féin's North Belfast MLA Gerry Kelly makes the front pages of all the Northern Ireland papers. Both the News Letter and Belfast Telegraph make Mr Kelly's decision to remove a clamp from his car using what appeared to be bolt cutters their lead story. It is the second story in the Irish News, under the headline "Sinn Féin urged to clamp down on Kelly" with a page of coverage further in the paper. 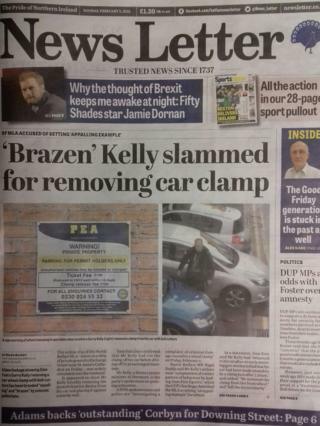 "'Brazen' Kelly slammed for removing car clamp" is the News Letter's headline, with their story focusing in on unionist criticism of the former IRA man's actions. It devotes another two pages of coverage to the story further in, focusing on unionist calls for Mr Kelly to resign his seat. The News Letter's editorial calls on other parties to quit Stormont talks aimed at restoring power-sharing in Northern Ireland if Mr Kelly remains a member of the Sinn Féin negotiating team, at least "until this matter is cleared up". However, it does call on Mr Kelly to resign from the Policing Board. The Belfast Telegraph's editorial does not mention any possible resignation but it does say that the incident raises questions about Sinn Féin's attitude to policing and justice. In political news, the News Letter's Sam McBride writes that DUP MPs are continuing to support a de facto amnesty for security force members involved in the Troubles. The party leader, Arlene Foster, however, believes that such a move could also lead to an amnesty for terrorist suspects, Mr McBride writes. Staying with politics, writing in the News Letter columnist Alex Kane says the "'moment' for truth and reconciliation [in Northern Ireland] has come and gone". He writes of his belief that the majority of people here continue to vote on traditional lines and about how neither unionism or republicanism can be expected to promote a "shared future" as that is "the end goal of neither". In an almost non-political story the Belfast Telegraph covers the bizarre moment when Amanda Knox, the American convicted but later cleared of murder in Italy in 2007, sang a chorus from Irish rebel song 'Come Out Ye Black And Tans'. It happened during an interview with RTÉ's Late Late Show on Friday night, much to the surprise of host Ray D'Arcy, the paper reports. The lead story in the Irish News is entirely apolitical: "Flu left my girl fighting for life". Seven-year-old Irish dancer Carla O'Brien, from Greenlough near Portglenone, became very ill after the flu aggravated hidden diabetes, the paper reports. She is on the mend now but had been in a critical condition in the Royal Belfast Hospital for Sick Children. The family hope that by highlighting the story other parents will be forewarned about the possibility their child may have diabetes. The Irish News' editorial describes the situation the O'Brien family found themselves in as every parent's worst nightmare. 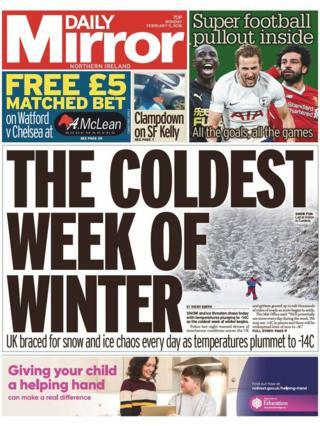 The Daily Mirror lead with a weather story and the prospect that temperatures in the UK could get as low as -14c this week.